Although California is having an extreme drought this year, that is not as large of a threat to California’s redwoods, sequoias, and bristlecone pines as an increasingly drier, warmer climate for the next few decades as a result of climate change. Sequoias are some of the world’s most voluminous trees, and if there isn’t enough snowpack in winter, or there are too many fires in summer, their seedling’s roots can’t grow enough and they won’t survive. 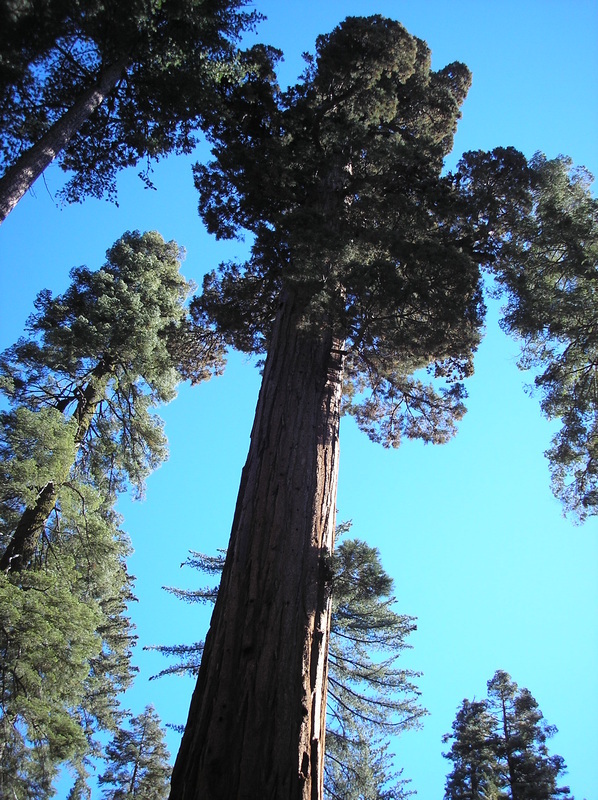 This is despite adult sequoia’s extreme fire resistance – they have spongy bark that is up to 8 inches thick and prevents the tree from being killed by fire. Sequoias also have an extremely limited range, since they are only found in a 70-mile wide area of the Sierra Nevada mountains. ” “If there’s long-term drought, within 25 years, we could see seedlings in trouble,” said Nathan Stephenson, an ecologist with the United States Geological Survey. “In 50 years, the whole population could be in trouble,” he went on, and within a century “most of the big trees could be gone.” “California’s iconic coastal redwood trees are reliant on moisture from fog, especially with California’s Mediterranean climate, which means they often receive no rainfall each summer. The number of foggy days in the past 50 years in their range has declined 30 percent. In the hotter and drier parts of their range, scientists have noticed redwoods dropping needles and getting thinner due to less fog. The oldest trees in the world, the bristlecone pine, are being attacked by bark beetles and blister rust where mountain tops have been warming. Scientists have noticed that the world’s big trees have been dying at high rates, so this is not only a problem in California. There may be some things they can do to counteract some of their threats, such as find bristlecone pines with higher resistance to blister rust, or planting sequoias in more areas, but they are still very worried. I was lucky enough to grow up with redwoods in my “backyard” and walked through redwood forest to get to class every day at the University of California, Santa Cruz, so this is certainly an issue that I am worried about, too. Looking up at a giant sequoia in Yosemite. Photo taken by me.